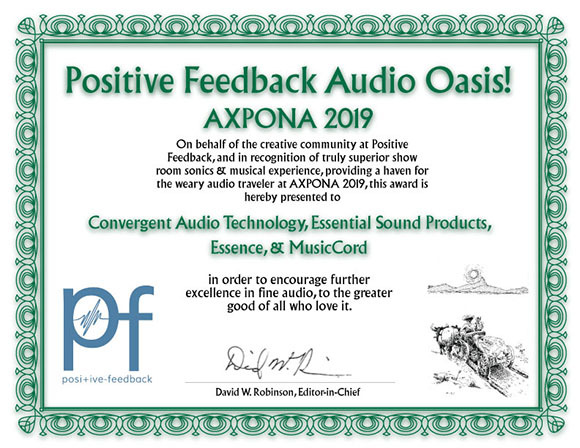 Chicago, IL, USA, April, 2019 – “Positive Feedback”, a premier High-End Audio magazine, announced the recipients of their “Audio Oasis” award for special recognition “of truly superior show room sonics & musical experience” at AXPONA 2019. This is the second year in a row that Essential Sound Products has received this award at AXPONA, shared this year with Convergent Audio Technology. The Essence power cord has been renowned for its groundbreaking performance since the original version was introduced in 1995. The 5th generation Reference-II is based upon patented, shielded cable technology at once affords the highest fidelity, rich natural tonal palette, lifelike dynamic contrast and transient speed, and the quietest backgrounds. The Essence Reference-II combines state-of-the-art design and the best materials with our proprietary termination process. AXPONA (Audio Expo North America) 2019, held this year April 12-14 at Renaissance Schaumburg Hotel & Convention Center in Schaumburg (a suburb of Chicago), is the largest High-End audio show in North America. 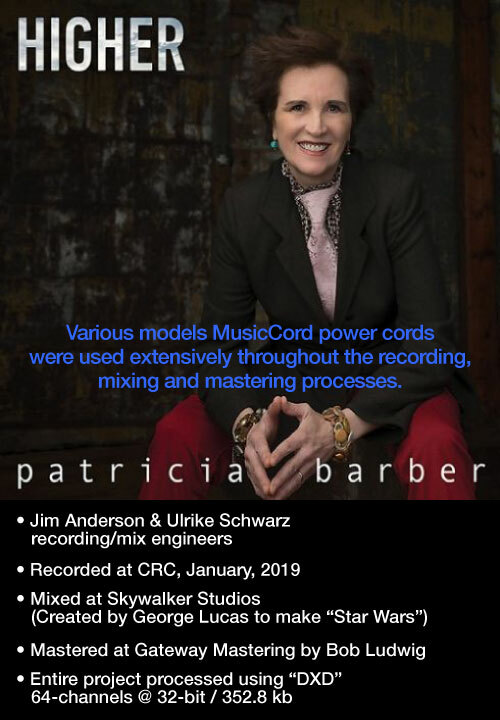 Chicago, IL, USA, March, 2019 - Various models of MusicCord power cords were used extensively throughout the recording, mixing and mastering processes for Patricia Barber's latest album "Higher". The project was recorded by multi-Grammy winning engineer Jim Anderson and wife Ulrike Schwarz, January 2019, at Chicago Recording Company (CRC). Jim has recorded Patricia Barber's projects for the past 23-years. For this project, Mr. Anderson called Essential Sound Products president Michael Griffin saying that he wanted to "go all out" in terms of using the best technology tools available. In response, Mr. Griffin assembled a box full of MusicCord, MusicCord-PRO power cords and Power Distributor strip, and MusicCord-PRO ES power cords. He then drove to CRC to hand deliver them to the studio. These additional MusicCords allowed Jim to integrate the cords throughout the studio on pratically every desirable component from tube microphone power supplies to direct inputs, John Hardy mic pre-amps that Jim had brought in for the session, A/D Interfaces and powered studio monitors. The recording was done simultaneously on the in-house AVID HD Interfaces and a custom-built laptop capable of 64-channels at 32-bit/352.8kb sampling rate. Mixing was performed at Skywalker Sound in California. MusicCord power cords were installed on select components at Skywalker during the mixing process. 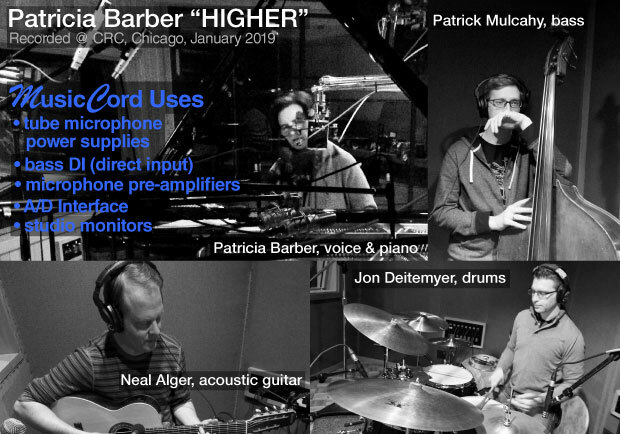 The Patricia Barber "Higher" project was mastered at Gateway Mastering Studios by legendary mastering engineer Bob Ludwig. MusicCord-PRO ES power cords were used on Bob's Horus D/A Interface. 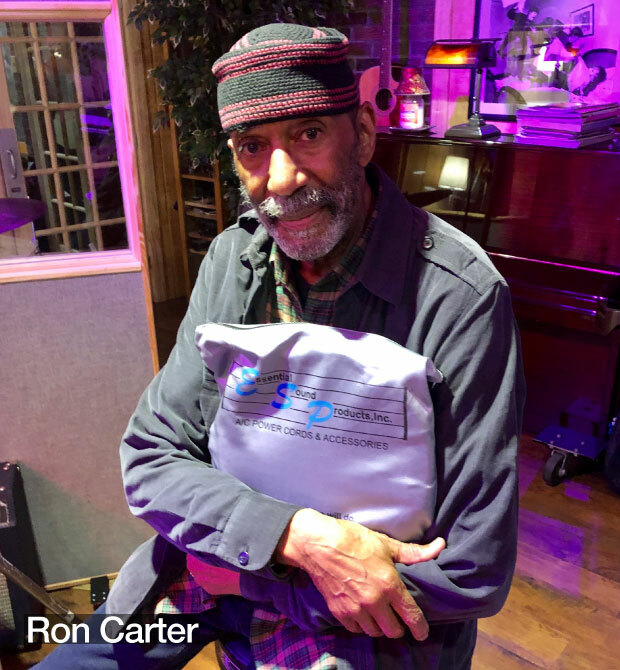 New York City, NY, USA, January, 2019 - Legendary jazz bassist, "The Maestro" Ron Carter endorses Essential Sound Products power cords. After auditioning several models, Ron chose The Essence Reference-II power cord to use with his live sound rig. hammer-on and harmonic bass technique. and audible with the Reference-II cord. Essential Sound Products president Michael Griffin first met Mr. Carter in October, 2018. He was beginning a 3-week engagement at New York's famous Birdland Jazz Club. "I brought with me a Gerald Veasley Signature MusicCord-PRO because it was red; the same color as the Epifani bass speaker cabinet Ron uses for live performances, and gave it to Sergio Larios, Ron's longtime bass technician. Sergio immediately replaced the stock cord with the MusicCord-PRO and Ron used it that evening." 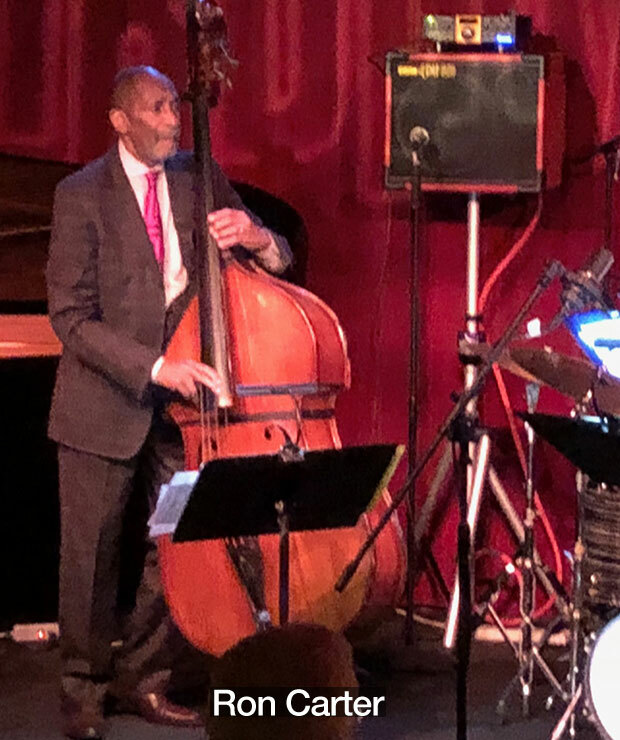 Ron Carter has a unique bass rig setup with the speaker cabinet mounted on a pole to elevate it to Ron's ear height. Sergio explained "Ron wants to hear exactly what the audience is hearing". Mr. Carter, an avid audiophile, visited Essential Sound Products' website where he saw that there were several other model power cords. Ron asked if he could audition the other models. Of course Michael Griffin said "Yes sir". Ron received the additional power cords while still performing his 3-week Birdland engagement. After an initial audition of a Reference-II cord, Ron asked if he could take the cord with him on his upcomming European and Asian tours. Again, Michael said "Yes sir". When Mr. Carter returned from the Asian tour, he call Michael to tell him that he preferred The Essence Reference-II power cord. Ron explained, "I use a very percussive, chordal, hammer-on and harmonic bass technique. All the different nuances are more pronounced and audible with the Reference-II cord. This cable’s consistently clean sound aids the amp to produce a truer bass sound." Ron Carter is a multi-Grammy winning recording artist, composer, arranger, educator & author. Mr. Carter holds the distinction of being the most recorded jazz bassist in history. Early in his career during the mid 1960's, Ron was part of what most consider the 2nd great Miles Davis Quintet along with Wayne Shorter, Herbie Hancock and Tony Williams. 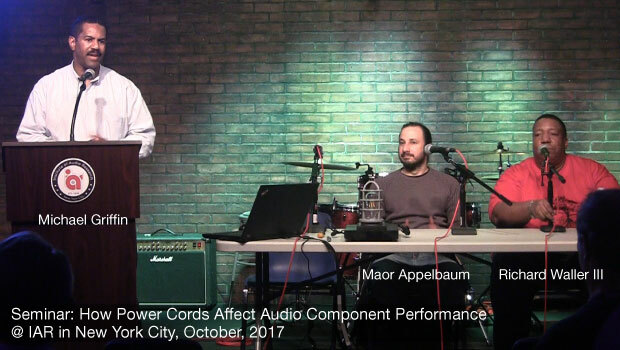 New York City, NY, USA, October, 2017 - Essential Sound Products presented technical details and answered questions relating to how ac power cords affect the performance of audio components at the prestigious Institute Of Audio Research (IAR). The presentsation was given on the eve of the 143rd Audio Engineeing Socitey convention. Presenters included mastering engineer Maor Appelbaum, recording/mix engineer Richard Waller III and Michael Griffin, inventor and Essential Sound Products president. The 2-hour presentation and Q&A session focused on technical details about audio equipment power supplies, the primary component parts and their functions, with special emphasis on energy storage devices. Included was an overview of the design evolution of power supplies from the 1970’s to the present, and its performance implication. Modern power supplies are capable of responding much faster to changes in audio signal amplitude and frequency spectrum. Power supply performance was discussed from a system perspective, examining what happens as a musical signal is processed. Oscilloscope screen shots revealed how current amplitude is modulated by the musical signal to recharge energy storage devices during a small fraction of the voltage carrier frequency cycle. Power cable design characteristics were discussed in relation to its functional objective as part of the overall power supply system. 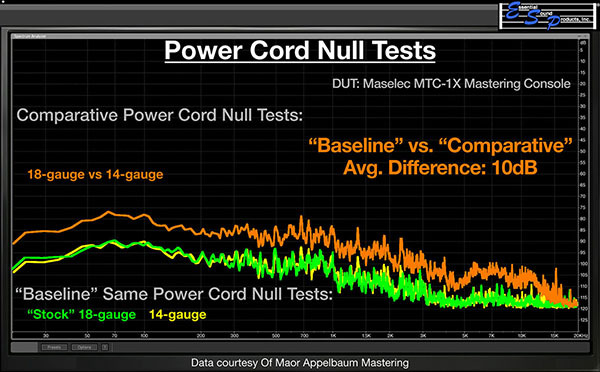 Measurement data was shared showing performance differences among several power cable designs and in-application performance effects of specific features such as shielding and how it reduces audio equipment noise. 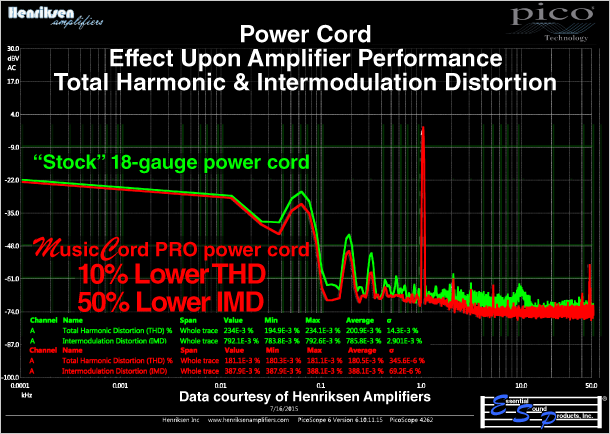 In-application data also included 3rd party measurements showing how switching from a stock power cord to one of our high-performance models significantly lowered Total Harmonic (THD) and Intermodulation (IMD) distortions. A highlight of the presentation was the review of null tests results. Maor Appelbaum, the engineer who performed the null tests, lead the discussion. A null test is a definitive way to confirm whether a difference exists between two copies of the same audio sample. Two sample-locked files are played with one phase inverted. If the files are identical they will cancel each other. If not, what will remain is the difference between the two. The null tests results, comparing files made with stock 18- and 14-gauge, and MusicCord-PRO power cords, revealed significant performance differences in the range of 10-20 dB. The presentation was followed by a visual demonstration showing that just by swapping the power cable connected to an LED light bulb from an 18-gauge to MusicCord-PRO, the brightness was noticably increased. A lively question and answer session wrapped up the event. Maor Appelbaum is a mastering engineer and owner of Maor Appelbaum Mastering located in suburban Los Angeles, CA. He has broad experience with the international music industry, mastering various styles of music and sounds from all over the world. Credits include mastering projects by Faith No More and Lupe Fiasco. Mr. Appelbaum also specializes in mastering for all major Internet and social media platforms. Richard Waller III is a Grammy winning, multi-platinum recording and mixing engineer, and owner of Smackhouse Recording Studios located in Philadelphia, PA. He has more than 25 years’ experience in the music industry as a record producer, engineer, musician and educator. Credits include recording and mix engineer on projects by Gerald Veasley and John Legend. Additionally, Mr. Waller is a BMI songwriter and publisher, and a NARAS (The Grammys) member. Michael Griffin is president and founder of Essential Sound Products headquartered in Rochester, MI. He has over 35 years’ experience in product design, engineering and project management. Mr. Griffin holds five (5) US patents for product inventions including the cable geometries employed in the company’s line of high performance audio power cords. For more information about our proven technology and road-worthy build quality, visit our technology web page here. 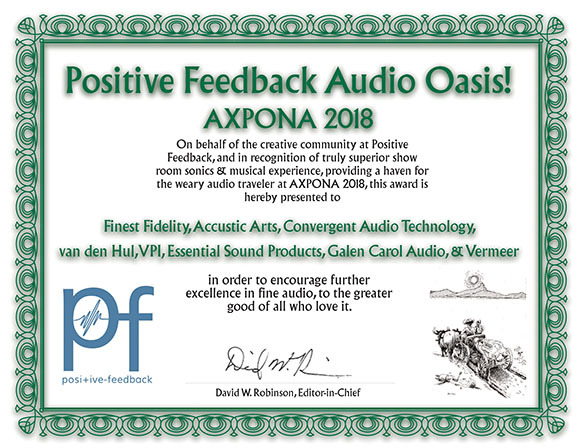 Chicago, IL, USA, April, 2018 – “Positive Feedback”, a premier High-End Audio magazine, announced the recipients of their “Audio Oasis” award for special recognition “of truly superior show room sonics & musical experience” at AXPONA 2018. Among those receiving the award was the exhibit that included products from Essential Sound Products, Convergent Audio Technology, van den Hul, Finest Fidelity, Accustic Arts and Vermeer. AXPONA (Audio Expo North America) 2018, held this year April 13-15 at Renaissance Schaumburg Hotel & Convention Center in Schaumburg (a suburb of Chicago), is the largest high-end audio show in North America. According to AXPONA Vice President of Sales Mark Freed, this year’s show set records for listening rooms (165) and attendees (8,134). 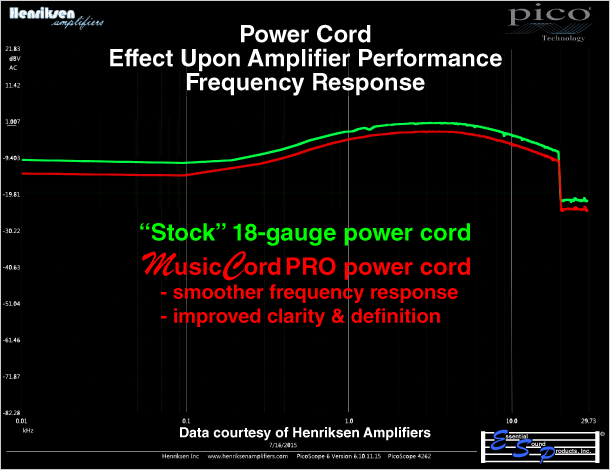 Rochester, Michigan, USA, September 2015 - Essential Sound Products releases guitar amplifier performance measurements supplied by Henriksen Amplifiers, comparing frequency response and distortion, using the "stock" 18-gauge power cord and MusicCord-PRO. These data show significant improvements in the amplifier's frequency response and total harmonic distortion, and even more dramatic reduction in intermodulation distortion. Why should you care? While audio enthusiasts and recording industry professionals are being trained to think that higher bit rates and sampling frequencies are the holy grail of digital recording and playback perfection, they might be overlooking a far more damaging source of distortion artifacts that have come to be negatively associated with "digital sound". By significantly reducing intermodulation distortion, MusicCord power cords make "digital" sound more "analog", and analog even clearer with more natural warmth. While most audio components are judged based upon subjective listening evaluation, many skeptics are quick to impose a different standard when it comes to audio cables, especially ac power cords. Having already bought into the paradigm that audio cables are "snake oil", they immediately will say "show me some objective test results". Well, the good folks at Henriksen Amplifiers have provided just what the skeptics and naysayers have asked for, independent, objective test data. 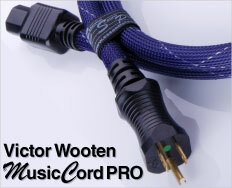 They purchased a MusicCord-PRO power cord after it was recommended by jazz guitarist Jacque Lesure. A group of Henriksen employees listened to "The Bud" guitar amplifier with the stock 18-gauge power cord and then MusicCord-PRO. They did blind testing and found the (MusicCord-PRO) cable "had an effect on high and low end clarity." Still skeptical, Henriksen engineer Nathan Mender decided to do some comparative performance testing. First, a frequency response comparison was performed. The graph to the right shows the results. Notice that with stock power cord, the response curve is comparatively jagged with an approximate 2 dB notch deviation at 2kHz. The amplifier frequency response curve using MusicCord-PRO is smooth with no abrupt deviations. The engineer commented "…the frequency response curve is smoother with the (MusicCord-PRO) cable, which results in a more natural and accurate reproduction of sound." Next, the amplifier's levels of Total Harmonic Distortion (THD) and Intermodulation Distortion (IMD) were measured using the stock power cord and then MusicCord-PRO. Total Harmonic Distortion was reduced from an average 0.20% to 0.18%, about a 10% reduction. Intermodulation Distortion was reduced from an average 0.79% to 0.39%, a greater than 50% reduction! Intermodulation Distortion is caused by amplitude modulation of signals containing two or more frequencies, which are not "harmonic" or some multiple of either frequency. Because it is not masked by the harmonics of the signal, Iintermodulation Distortion is much more perceptible to human hearing and is exhibited as distortion such as midrange harshness on dynamic peaks, loss of definition in bass frequencies, and a loss of resolution and soundstage spatial cues such as depth and left-to-right separation of image objects. Rochester, Michigan, USA, June, 2013 - Essential Sound Products adds adhesive backed "hook and loop" squares with MusicCord & MusicCord-PRO power cords to form a positive retention system when used with the included cord wrap. MusicCord and MusicCord-PRO power cords are used by a number of touring musicians. In working with them we learned that some with "tall stack" amplifiers can have the IEC power cord jack elevated so as to suspend most of the power cable length in the air. The IEC connection is not designed for positive retention. Therefore, the suspended cable weight can cause disengagement. 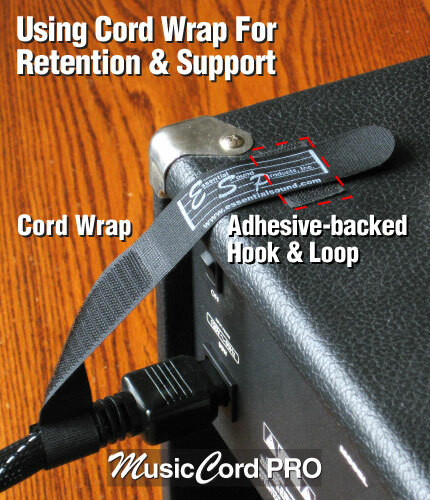 MusicCord and MusicCord-PRO already come with a "hook and loop" cord wrap for securing the coiled cable in transport. We saw an opportunity to use the cord wrap to provide positive retention for the IEC connection. Now included free with every 2-meter (or longer) length MusicCord and MusicCord-PRO power cord is an adhesive-backed "hook" square. Once affixed above the IEC jack on your amplifier, the cord wrap can be engaged, forming a reliable retention system that supports the weight and relieves stress on the chassis jack. MusicCord Professional Series power cords are based upon a patented multiple-conductor cable design that replaces a single line or neutral conductor with several smaller conductors. This design eliminates phase distortions and speeds current flow to the component's power supply. MusicCord's groundbreaking performance is matched only by its rugged, high quality construction. MusicCord power cords also establish a new industry standard for quality and reliability. Their road-worthy build quality is validated by meeting hospital grade standards for mechanical integrity. MusicCord and MusicCord-PRO power cords are backed by a limited lifetime warranty. MusicCord-PRO Earns Highest Ratings For Build & Sound Quality by UK's "Bass Guitar Magazine"
December, 2012 - One of Europe's most influential bass publications "Bass Guitar Magazine" evaluated MusicCord-PRO power cord and rated it in three categories. The results confirmed the PRO's outstanding combination of performance and build quality. MusicCord-PRO scored a 9/10 for performance and 10/10 for build quality! 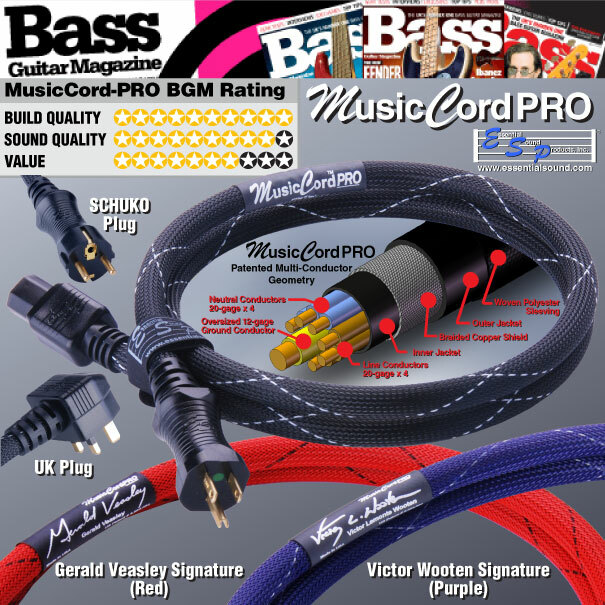 "Bass Guitar Magazine" is the first publication outside of North America to formally evaluate MusicCord power cords. This is significant as many international customers who have 220-240 Volts ac mains service wonder how MusicCord-PRO would perform in their home country. The results are in - MusicCord-PRO excels in the UK, Eurpoe & worldwide! 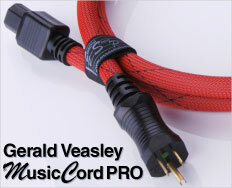 MusicCord-PRO is avaialble in standard (black), Victor Wooten (purple) and Gerald Veasley (red) "Signature" versions. For additional information, please cick on links below. MusicCord-PRO Power Cord And The Movie "John Carter"
Rochester, Michigan, USA, March, 2012 - Essential Sound Products' MusicCord-PRO power cords were used with microphone pre-amps and other components to record the strings for the musical score to the movie "John Carter". String instruments including violins and cellos were recorded at the Sony - Barbara Streisand Recording Stage in November and December 2011. A total of nine (9) MusicCord-PRO power cords were used with microphone pre-amplifiers and other critical components in the recording chain. The impact of using MusicCord-PRO in the recording process was reported to be more natural warmth and sweetness overall, and better image focus, especially noticable on the cello solos. 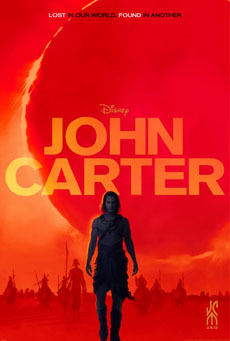 "John Carter" debuts at theaters in the United States and Canada on Friday, March 9, 2012. MusicCord Professional Series power cords are based upon a patented multiple-conductor cable design that replaces a single line or neutral conductor with several smaller conductors. This design eliminates phase distortions and speeds current flow to the component's power supply. MusicCord's groundbreaking performance is matched only by its rugged, high quality construction. MusicCord power cords also establish a new industry standard for quality and reliability. Their road-worthy build quality is validated by meeting hospital grade standards for mechanical integrity. To achieve this designation, MusicCord power cords had to pass additional mechanical abuse testing. 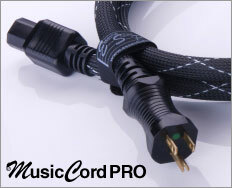 MusicCord and MusicCord-PRO power cords are backed by our limited lifetime warranty. Essential Sound Products, Inc. is a custom designer and manufacturer of high-performance ac power components and cable accessories for all audio and video applications including instrument amplifiers and studio recording gear, home audio and home theater systems, PA and residential/commercial custom installations. The company has been a pioneer in ac power cordage innovation since introduction of 'The Essence' brand of ac power products to high end audio enthusiast in 1995. Essential Sound Products is headquartered in Rochester, Michigan. All products are designed and assembled the USA. CONTACT: Essential Sound Products, Inc.